Foothills, montane. Meadows. Spring, early summer. Meadow in western San Juan National Forest, June 10, 2010. 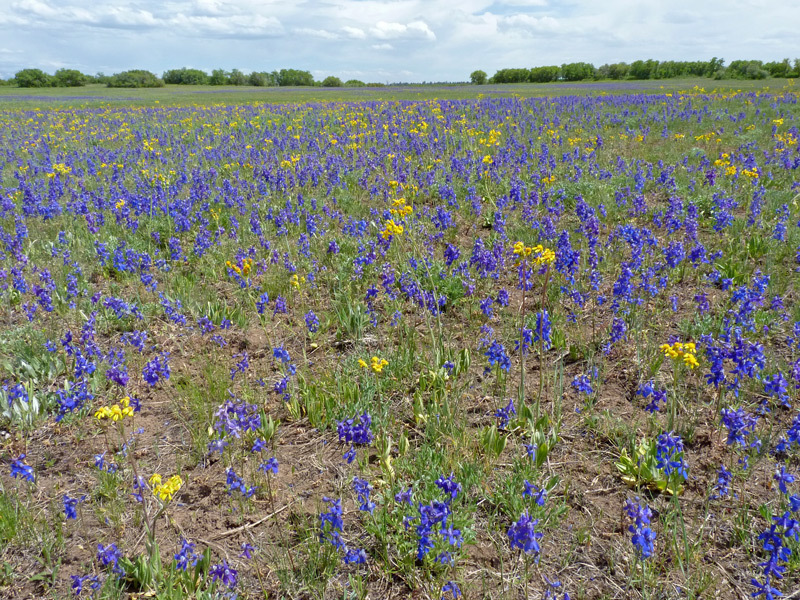 Delphinium nuttallianum mixes with golden Senecio integerrimus and spreads over a hundred acres. Stoner Mesa Trail, June 23, 2005. 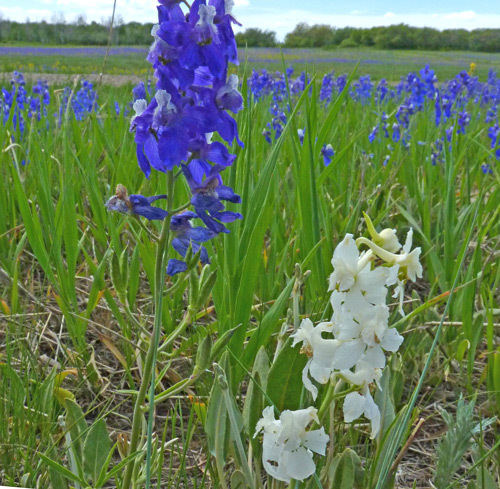 In the early spring, lovely violet-blue Delphinium nuttallianum appears in solitary patches in open woods and also in massive arrays in meadows. 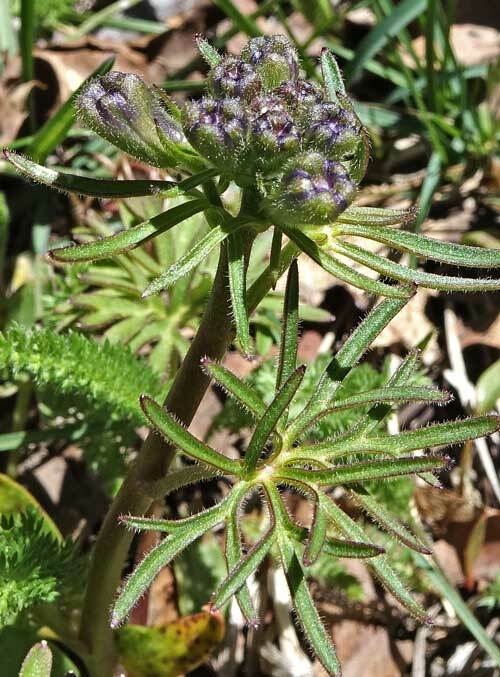 The plant is found from about 7,000' to 9,500' in elevation. 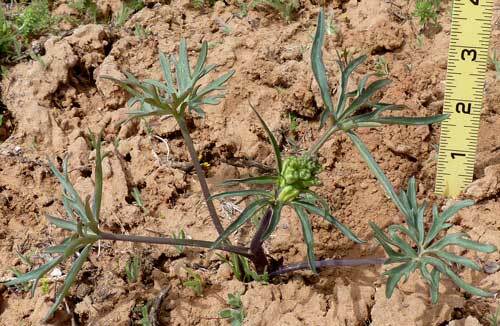 Delphinium nuttallianum produces several deeply dissected basal leaves early in the spring and then puts up a 6-to-12 inch flower stalk with several more dissected leaves. By the time the flowers are fully opened, as in the photograph at left, the basal leaves are usually withered. The lower arrows point to the dried, buff-colored leaves at the bottom of the stalk. The two upper arrows point to the green star-burst shaped, three-chambered seed pods ("follicles"). Each follicle will split ("dehisce") along one side and spill the numerous seeds. 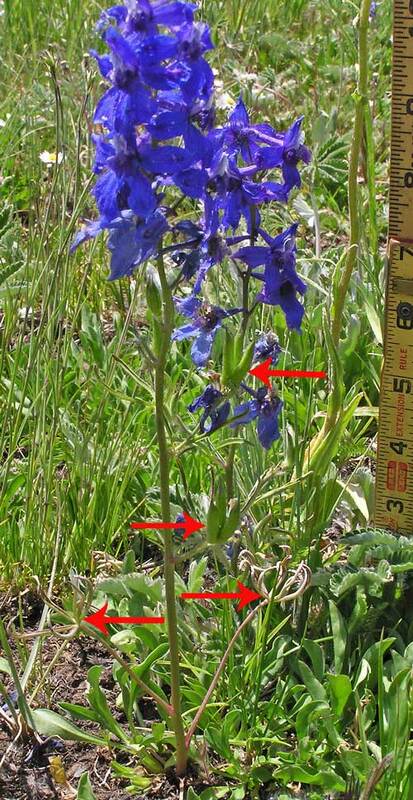 The common name, "Larkspur", comes from the similarity of the spur on the rear of the flower to a Lark's foot structure. Linnaeus named this genus in 1753. "Delphinium" is from the Latin "delphinus", "Dolphin", for the resemblance of the flower buds to Dolphins. (Click to see the Dolphins.) Thomas Nuttall, Harvard teacher and one of the most highly praised 19th century botanists and explorers, collected this species in 1834 near the Columbia River and in 1843 Pritzel named this species for Nuttall. (More biographical information about Nuttall.) Edward Greene named and described this plant in 1896 from a specimen collected in 1894 in Wyoming by Aven Nelson, the great University of Wyoming botanist. It was later realized that Nelson's plant was the same as the one discovered by Nuttall 60 years earlier and, therefore, the name "Delphinium nelsonii", was ruled illegitimate. Meadow in western San Juan National Forest, May 13, 2017. Albino Delphinium nuttallianum are a rare treat. Narraguinnep Natural Area, May 28, 2004.